Retirement readiness and retirement planning lead to the best retirement income plans. In other words, today’s retirement-income designations provide you with only one-third of the professional knowledge you need to help your clients have a successful retirement. The original CRC® study guides were developed over a two-year period in accordance with the academic guidance of the Center for Financial Responsibility at Texas Tech University. The CRC® program distinguishes itself with being the only retirement-specific, accredited certification that covers accumulation, at retirement and distribution planning. It also extends beyond purely financial topics, and covers counseling skills needed to effectively communicate with clients of various generations and life cycle needs. CRC 2 & 3 are approved for 5 CFP® CE credits. After passing each exam, CFP credits can be self-reported for free or InFRE can report credits for $25 per course. Contact us for more information about group discounts. If you have questions regarding the optional educational resources offered by InFRE, please call 847-756-7350 ext. 134. 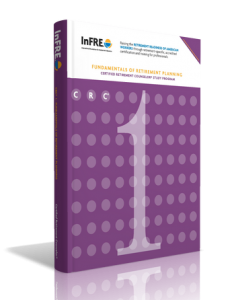 The InFRE five-part print study guide bundle helps CRC® candidates prepare for the CRC® examinations. Buy all five guides at once, a perfect addition to your professional library, and receive a quantity discount while also saving money on shipping! Read more! The CRC exam fee is $525 and may be paid at the time you are ready to take the exam. The total fee when paying for your study guides and the CRC examination fee separately is therefore $1,024 ($499 study guides + $525 exam). You can save $99 off the study guides by paying only $925 for both the study guide and exam fees now. 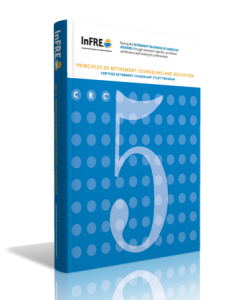 By taking a close look at how to plan for retirement at different career stages, CRC® Course #1 provides techniques for understanding the broad variety of factors that can affect a client’s retirement goals. With a strong emphasis on how the basic tools of financial planning can be used to best prepare for retirement, this course establishes the foundation of the CRC® series. CRC® #1 features methods for motivating and educating clients on the need to save for retirement, and the importance of taking personal responsibility for their own financial futures. Read more! For a retirement program to work as envisioned, retirement professionals must thoroughly understand the basic concepts and terminology needed to help clients/participants/employees invest wisely for their long-term retirement goals. In this course, you’ll learn investment concepts that are critical to effective retirement counseling. Emphasis is on training the retirement counselor to assist members/participants in feeling comfortable with the investment decisions that must be made to achieve a financially worry-free retirement. The course includes a discussion of how to present the information in the course to members/participants. 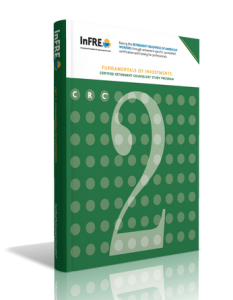 In CRC® #2 you’ll gain familiarity with investment concepts that are critical to effective retirement counseling. Read more! Clients have distinctive retirement planning needs. There is no one-size-fits-all best retirement plan that is tailored to everyone’s unique requirements. 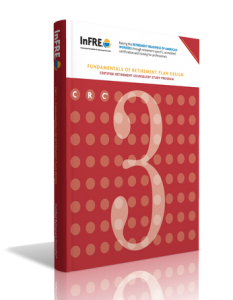 CRC® #3 arms retirement professionals with the key plan concepts and features to help them guide and assist clients in determining which types and combinations of retirement plans are likely to be best for them. 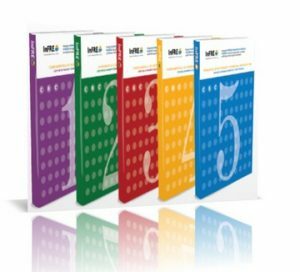 CRC® #3 helps the retirement professional translate the complex and often confusing information to clients/participants of various backgrounds need as they consider their retirement planning needs. Read more! 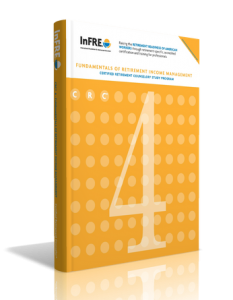 In InFRE’s CRC® #4 you will study InFRE’s unique Retirement Income Management content. This guide allows professionals to finalize the knowledge needed to create a lifetime income stream after retirement. The focus is on how to use a process to help clients evaluate and manage retirement risks. CRC®#4 teaches you to coordinate the work you do as a retirement professional with other advisors essential to the retirement planning process. Read more! This course will help you become a true retirement “counselor” in every sense of the word by teaching how to communicate with various personality types and provide educational content using a variety of media. Helping employees/clients understand when and how to work with other retirement professionals is part of being a counselor. CRC®#5 also includes the CRC Code of Ethics which must be well understood and applied by all CRC certificants. Study guides may be returned in unused condition within ten business days from the date of receipt. No refunds will be granted when study guides are returned more than ten business days from the date of receipt or in damaged condition. The full refund policy including the examination fee or rescheduling an examination is available here.